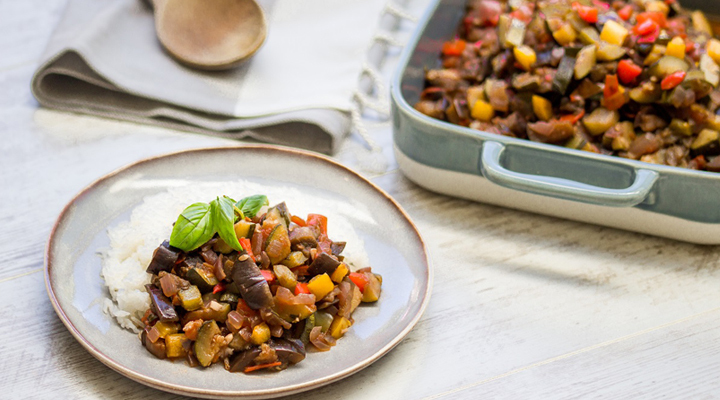 Quick and easy, this delicious, hearty Ratatouille is perfect for those long days! It is suitable for both your weaning baby and the whole family. Just puree or finely chop your baby's portion and offer some whole pasta for dipping. If your lot is like mine, they will love it! *This recipe serves 4-6 people. 1. Prepare the vegetables. Deseed the peppers and cut into 2.5cm chunks. Finely slice the basil stalk. 2. Add 2 tablespoons for oil to a large casserole pan. Add the vegetables and cook for about 5 minutes until golden brown. Cook in batches if your pan is too small. 3. Spoon the veg into a large bowl and add some more oil to the pan. 4. Add the garlic, onion, basil and thyme leaves. Cook for 10-15 minutes until all vegetables are softened and golden. 5. Return the cooked veg to the pan and stir in the fresh tomatoes. 6. Add the balsamic vinegar a pinch of salt and pepper. 7. Simmer over a low heat for 30-35 minutes, stirring all the time. 8. Serve with either rice or pasta. Puree your baby’s portion. *Allow to cool for at least 30 minutes prior to freezing or placing in the fridge. Cool in the fridge for 2 hours before freezing. This recipe will keep in the freezer for 3-4 months* without the rice or pasta. Store in the Mixed Starter Set pots to ensure you only defrost what you need for your weaning baby. Ensure not to batch blend too much here as a portion prepared for stage 1 will have no benefit for stage 2 due to pureed texture. Suitable for your weaning baby from 4months+ blended without the pasta/rice. Serve as a finger food from 6 months+ with carbohydrates onwards or as a dinner adjusting the texture as required.